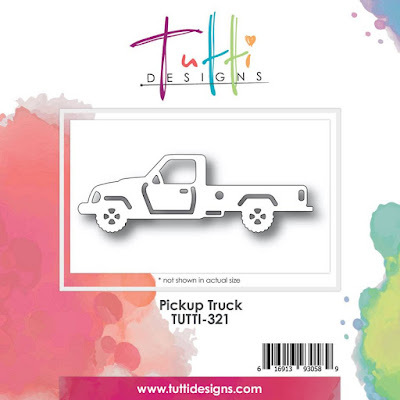 Tutti Designs: Need A Little Pickup? Donna Phelan back once again to share another Masculine creation! Check out this perfect little Pickup Truck. Pretty FAB, right? You'll find a variety of vehicles to choose from at the Tutti Designs Store. Varooooom! A nice clean and simple design. I have let this awesome Pickup Truck die do all of the work! I die cut it from black card stock and backed it with a bit of silver and red foil. The candles in the bed are images printed with Toner that are easily foiled. I just foiled and fussy cut them out. Perfect for a celebration! Everyday you will find new and creative inspiration right here, on the Tutti Designs Blog! Each Wednesday I will be back to share some new and creative card making ideas with you all! OMG! This is just awesome! What a FABULOUS way to use this truck! And those candles are certainly PARTY ready! FANTASTIC inspiration ... thanks SO MUCH! !